A dear friend of mine in the States, posted this recipe on Facebook, and I just had to try it – with my usual adaptions to make it slightly less unhealthy! 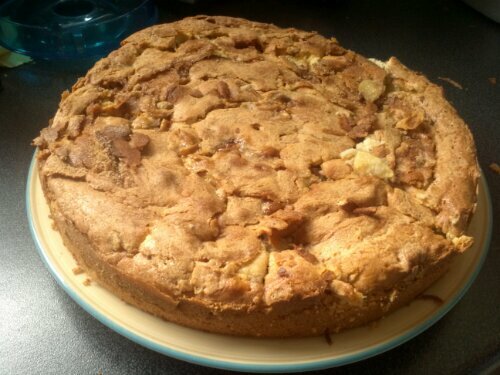 The link my friend sent me was from a Facebook page called Welcome Home, https://www.facebook.com/WelcomeHomeFriends, and they got it from http://www.luicucina.com/2013/08/apple-cinnamon-white-cake.html I hope that covers where it came from so let me tell you how to do it!!! As usual, I have tried to change an American recipe using cups into one that I find easier to use, and so my measurements are in grams. I’m sure if I used cups all the time I would get used to them, but I am never confident about if I have over or under packed the cup, so it works best for me to translate it!